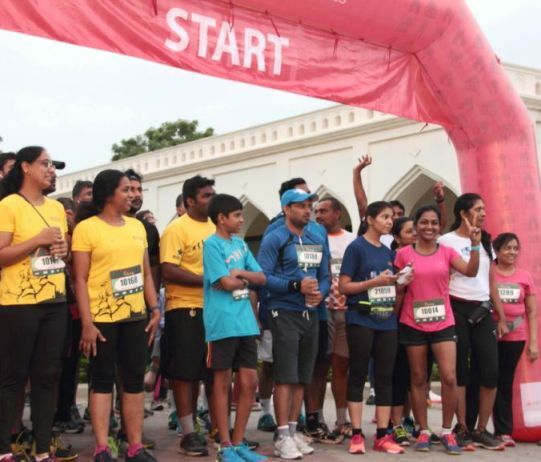 More than 750 runners and heritage enthusiasts including men, women and children participated at the Go Heritage Run – Hyderabad organized at Taramati Baradari on July 24, 2016. This fun run was organized in partnership with Hyderabad Runners Society, INTACH Hyderabad and Telangana Tourism. This run saw participation from children as young as 4 years old and as old as 76 years. The 21km run started at 5.55am and saw 320 participants, the 10km run was attended by 310 runners and about 200 participants joined the 5km run. More than 50 volunteers from Hyderabad Runners ensured that all runners had adequate support including water and electrolytes. Care Hospitals, the medical partner for Go Heritage Run – Hyderabad, provided medical support, paramedics and emergency standby vehicles. Mrs. Anuradha Reddy of INTACH Hyderabad led an interpretation walk at the Qutb Shahi tombs after the run was completed. Go Heritage Runs are an award-winning fun run series organized at heritage sites across India. Go Heritage Runs have been organized at both famous heritage sites such as Hampi, Ooty and lesser known sites such as Badami, Bidar. Hyderabad Runners Society is one of the largest running clubs in India and has been working for nearly 10 years towards promoting running as the preferred form of fitness in Hyderabad. The flagship event of Hyderabad Runners, the Airtel Hyderabad Marathon is scheduled for August 28.